Lateral epicondylitis or lateral epicondylalgia, better known as tennis elbow, is a condition where the outer part of the elbow becomes sore and tender. It is also called shooter’s elbow, archer’s elbow or simply lateral elbow pain. Since the pathogenesis of this condition is still unknown, there is no single agreed name. While the common name ‘tennis elbow’ suggests a strong link to racquet sports, this condition can also be caused by sports such as swimming and climbing, the work of manual workers and waiters, as well as activities of daily living (ADL). Tennis elbow is an overuse injury occurring in the lateral side of the elbow region, but more specifically it occurs at the common extensor tendon that originates from the lateral epicondyle of the humerous. Acute pain is experienced as the arm is extended. Overuse injury can also affect the back (posterior) part of the elbow as well. Golfer’s elbow: pain in the inner (medial) part of the elbow. In one study, data was collected from 113 patients who had tennis elbow and the main factor common to them all was overexertion. Sportspersons as well as those who used the same repetitive motion for many years, especially in their profession, suffered from tennis elbow. It was also common in individuals who performed motions they were unaccustomed to. The data also mentioned that the majority of patients suffered tennis elbow in their right arms. 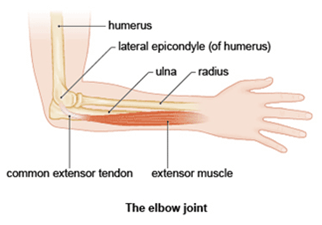 The elbow joint is surrounded by muscles that move the elbow, wrist and fingers. The tendons at your elbow join the muscles of the forearm to the bones and along with the muscles, control movement of the wrist and hand. When a person gets tennis elbow, one or more of the tendons on the lateral aspect of the elbow becomes painful. 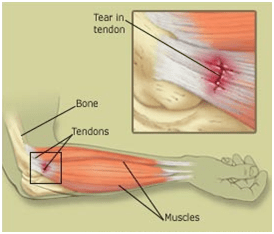 The pain occurs at the point where the tendons attach to the bone. Twisting movements, such as turning a door handle or opening the lid of a jar, are particularly painful. Tennis elbow is fairly uncommon. Approximately 5 in every 1,000 adults in the UK are affected by the condition each year. Tennis elbow usually occurs in adults and men and woman are affected equally. The condition tends to affect people who are around 40 years old. As you and your body try to compensate for the weakness in your elbow, you may also have pain or stiffness in other parts of the affected arm or in your shoulder and neck. 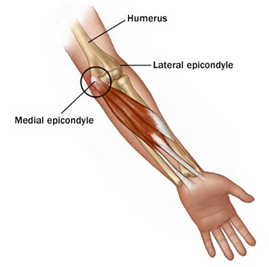 Golfer’s elbow (medial epicondylitis) causes pain and inflammation at the point where the flexor tendons of the forearm are attached to the upper arm. The pain centres on the bony bump on the inside of your elbow and may radiate into the forearm. It can usually be treated effectively with rest. Golfer’s elbow is usually caused by overuse of the muscles in the forearm that allow you to rotate your arm and flex your wrist. Repetitive flexing, gripping or swinging can cause pulls or tiny tears in the tendons close to where they are attached to the bone. Both tennis elbow and golfer’s elbow are forms of elbow tendinitis. The difference is that tennis elbow stems from damage to the extensor tendons on the outside of the elbow, while golfer’s elbow is caused by flexor tendons on the inside. The primary symptom of golfer’s elbow is pain that is centred near the bony knob on the inside of the elbow. Sometimes it extends all along the inner forearm. You are most likely to feel it when you bend your arm inwards or flex your wrist towards the body. In most cases, the pain becomes gradually worse. Elbow tendonitis is caused by small tears in the muscles of the forearm due to overuse of the muscles or minor injury. It can also occur as the result of a single, forceful injury. Repetitive, fine movements of the hand and wrist, such as typing or using scissors. You should visit your medical professional if the symptoms do not improve after you have avoided or modified the activity that is causing the problem, or if ordinary painkillers such as paracetamol are not effective. Ultrasound scan: An ultrasound scan uses high-frequency sound waves to create an image of part of the inside of your body. However, since there are many other conditions that can cause pain around the elbow, it is important that you seek medical advice so the correct diagnosis can be made. Then your medical professional can prescribe the appropriate treatment. Both conditions are self-limiting and this means that in the majority of cases the symptoms eventually improve and clear up without treatment. Most cases last between six months and two years, this is because tendons are slow to heal. However, in around 9 out of 10 cases, a full recovery is made within one year. There are medical (non-surgical) and surgical treatment options for tennis and golfer’s elbow. Medical treatments are tried first and in general surgery will only be recommended as a treatment of last resort, after failure to improve with medical treatments. The type of treatment recommended will depend on several factors including age, type of other medications being taken, overall health, medical history and severity of pain. The goals of treatment are to reduce pain or inflammation, promote healing and to decrease stress and abuse of the injured elbow, in order to return to normal elbow function. If you have elbow tendonitis, the most important method of management is rest. You should rest the affected arm as much as possible and avoid doing any activities that put more stress on the tendons. Taking painkillers, such as paracetamol and ibuprofen (NSAIDs), may help to reduce mild pain that is caused by elbow tendonitis. Children under 16 years old should not take aspirin. Ibuprofen also has anti-inflammatory properties, so helps reduce associated inflammation and swelling. These have been proven to provide some pain relief and reduce inflammation for musculoskeletal conditions (those that affect the muscles or bones). There is strong evidence from research that topical NSAIDs are effective in improving pain, stiffness and function, in particular, in osteoarthritis of the knee (Bookman et al., 2004; NICE, 2008). Anti-inflammatory creams and gels are often recommended for tennis elbow rather than anti-inflammatory tablets. This is because gels and creams provide effective pain relief and reduce inflammation without causing side effects, such as nausea, irritation of the stomach lining and diarrhoea. Avoid using topical NSAIDs during pregnancy and breastfeeding. Many topical NSAIDs are also unsuitable for children. Ask your pharmacist or medical professional for advice if you are not sure about whether a topical NSAID is suitable for you or your child. A corticosteroid injection may be recommended if: your symptoms are prolonged; your pain is severe; your elbow function is grossly limited; or NSAIDs have been ineffective. Corticosteroids are a medication that contains steroids (a type of hormone) that helps to reduce inflammation. The injection will be made directly into the painful area around your elbow. You may be given a local anaesthetic to numb the area to reduce pain while the injection is being given. But steroids are often injected along with a local anaesthetic to provide immediate pain relief while the steroids takes time to work. Research has shown that when compared to physiotherapy and a ‘wait and see’ approach to see if symptoms disappear naturally, corticosteroid injections were not as effective at 52 weeks. However, they were effective in the short term, at six weeks after the treatment. High recurrence rates have also been reported in people who have corticosteroid injections. Wasting away of the surrounding subcutaneous tissue (the layer of tissue beneath the surface of the skin). Before you decide to have corticosteroid injections to treat elbow tendonitis, discuss the effectiveness and potential side effects with your medical professional. This will enable you to make a well-informed decision about this type of treatment. If your elbow tendonitis symptoms are particularly severe or persistent despite rest and use of NSAIDs, your medical professional may refer you to a physiotherapist. A physiotherapost is a healthcare professional who is trained to use physical methods, such as massage and manipulation, to promote healing. Shock wave therapy is where high-energy sound waves, like ultrasound, are passed through the skin of the affected area to help relieve the pain of elbow tendonitis and improve mobility (movement), this is normally performed by physiotherapists. The theory is that the shock waves stimulate blood flow to the tendons thus aiding healing. Skin damage around the area being treated. Research has shown that shock wave therapy is safe. However, NICE (2009) states that there is a lack of evidence of its effectiveness in treating tennis elbow, and more research is required. Your medical professional or physiotherapist may recommend shock wave therapy if other non-surgical treatments have proved to be ineffective in relieving your symptoms of tennis elbow. Discuss the potential risks, benefits and side effects with your medical professional or physiotherapist. Surgery may be recommended as a last resort treatment option in rare cases of severe or persistent elbow tendonitis. Surgery aims to relieve the painful symptoms by removing the damaged part of the tendon. It is often difficult to prevent elbow tendonitis. However, avoiding putting too much stress on the tendons of your elbow will help you to avoid the condition or to prevent your symptoms from getting worse. Increasing the strength of your forearm muscles can help prevent tennis elbow. A physiotherapist can advise you about suitable exercises to build up the muscles of your forearm. NICE (National Institute for Health and Clinical Excellence) (2009) Interventional Procedure Guidance 313: Extracorporeal Shockwave Therapy for Refractory Tennis Elbow. London: NICE. Arthritis Research UK (2011) Tennis Elbow. Available from World Wide Web: <www.arthritisresearchuk.org> [Accessed 16 May, 2011]. BMJ (British Medical Journal) Tennis Elbow. BMJ Best Practice. Available from World Wide Web: <www.bestpractice.bmj.com> [Accessed: 28 May, 2008]. eMedicine (2009) Physical Medicine and Rehabilitation for Lateral Epicondylitis. Available from World Wide Web: <http://www.emedicine.medscape.com> [Accessed: 24 July, 2009]. Orchard, J. & Kountouris, A. (2011) The Management of Tennis Elbow. British Medical Journal. 342, pp.26-87.